US intel specialist gives Somalia drones to combat al Shabaab bombings – Kenyatta University TV (KUTV). All Rights Reserved. A former US intelligence specialist has donated surveillance drones to police in Somalia, aiming to help combat a jump in deadly bombings by al Qaeda-linked insurgents. The gift comes as US President Donald Trump is increasing military engagement in the region. A member of the US Navy SEAL special forces was killed in Somalia earlier this month on a raid, the first US combat casualty in Somalia since 1993. The Somalis received five drones, some of which have infra-red or night vision capabilities, from Brett Velicovich, whose service with the US military features in a ‘Drone Warrior’, a book to be published next month. His life story is also being developed as a movie by Paramount Pictures. “There’s been a real increase in complex attacks,” the 33-year-old told Reuters on a rooftop overlooking the capital of Mogadishu, as drones swooped and whirred nearby during a four-day police training course. The al Shabaab insurgents have been steadily losing control of cities and towns in the Horn of Africa nation since withdrawing from the capital in 2011. But they are hitting back with increasingly large and complex bombings. Bombs killed at least 723 people and wounded 1,116 in Somalia last year, according to Nairobi-based think-tank Sahan Research, up from 193 dead and 442 wounded in 2015. Increasingly, al Shabaab is using several bombs or a combination of bombs and gunmen to attack security forces who respond. So Bancroft, a Washington-based organization contracted by the US State Department to train the Somali police, brought Velicovich to Mogadishu to show officers how to use drones in examining potential threats or blast sites. “I used to work with a lot of different drones in the US military and now we see the same type of technology readily available on the open market,” said Velicovich, who has worked on similar programmes in Iraq and Afghanistan, and is planning a programme against wildlife poachers in Kenya. The drones are made by China’s DJI company and are a combination of the commercially-available Mavic and Inspire models. The biggest has a range of up to 7 km (four miles). “We shall use the drones when we are in serious operations or when the enemy attack some places or innocent people,” said Somali police commissioner Abdihakin Dahir Sa’eed. One example that police cited was when gunmen ambushed officers responding to a car bomb on Mogadishu’s Lido beachfront last year. Police were unable to find the last attacker, holed up in a restaurant, for several hours. A drone might have found him in minutes, Velicovich said. 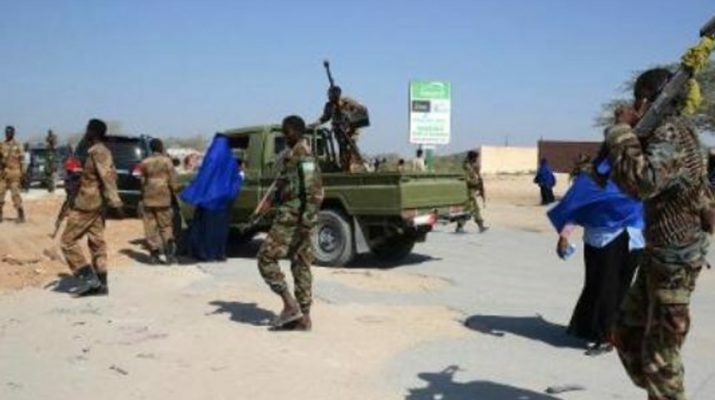 The gift follows a deal in London earlier this month between the Somali government and its Western allies to beef up the security forces and try to integrate regional militias. But huge problems face new President Mohamed Abdullahi Mohamed, elected by parliamentarians in February. The Somali security forces have been crippled by years of corruption. High-ranking officers stuffed the payrolls with names of their relatives and sold weapons and food intended for the rank-and-file. Both the police and military have often gone for months without pay, encouraging them to extort money from angry civilians. In an interview published on Friday, the president said his United Nations-backed government was so broke that he had not drawn a salary since taking office and had been unable to pay the military. “We inherited a financial situation in which the government was unable to pay army salaries on a regular basis,” he told the Saudi-owned newspaper Asharq al-Awsat.